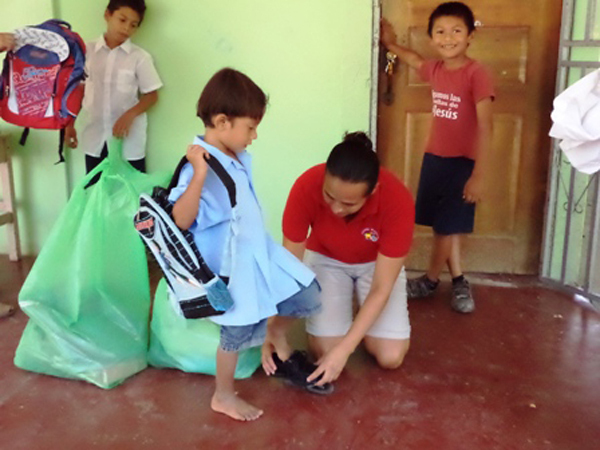 Starting February 28, Del Mar Academy community service committee (CSC) start delivering supplies and clothes to children in need to the schools of Nosara, Santa Marta, Garza, Esperanza, Santa Teresita, Los Angeles and Delicias. 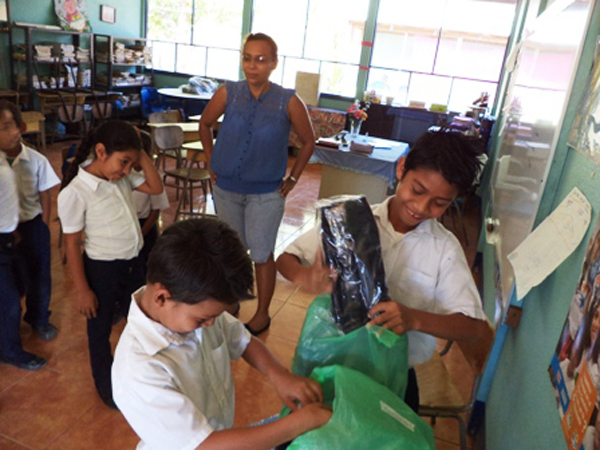 The committee is helping more than 50 children in the area of the “Gran Nosara" from 7 different schools. Thanks to all students and parents of DMA that made this effort become possible. This is the second year the CSC of DMA made a roundup to buy school supplies and uniforms to the children of the area. In 2012 the committee was able to buy all school supplies of all students of Los Angeles school. The community service committee members are all parents of students at DMA, their work is volunteer and they donate their time, effort, money and more for the projects they assume. If you have a project that needs help or want to cooperate with the CSC efforts, please contact the committee trough DMA Director office. The Fiestas held in Nosara last Saturday March 23 to help raise money for Los Arenales asphalt preparations work collected almost $6000 out of the $28000 that the community need. Pavement is coming for those who live along route 160. Since March 19, machinery from the Ministry of Public Works and Transportation (MOPT) entered the communities with the objective of partially paving 8.5 kilometers. Even though pavement is arriving to Nosara thanks to an agreement with CONAVI, not all of the costs are covered. In the Los Angeles neighborhood, neighbors need to raise 14 million colones ($28,000) to widen the main street and build curbs and gutters, so they decided to organize a fiesta this Saturday, the 23rd, to collect the funds. On Monday, March 18, the Samara Chamber of Tourism (CASATUR) called a meeting in the community, inviting more than 400 locals, residents and business owners, in order to plan for 20 additional police officers that the Public Force had offered during Easter Week. Some students from Serapio Lopez School in Nosara had to spend the first day of school sitting on the floor of their classroom. Fifth-grader Lara Schussler, 10, said, “It was really sad and uncomfortable.” Ashley Ruiz, 11, also in fifth grade, added that it was hard for them to concentrate on the class while sitting on the floor. Since last year, the Nosara Security Association has been trying to get the Ministry of Security to take over payments of the rent for the tourist police station in Guiones, but delays in paperwork have held up the process and now the association is almost out of money, once again renewing concerns that the tourist police might have to leave town. The wind kicks up the tin roof panels overhead, banging away while we speak. I sit scribbling fervently into my notebook as Xenia Waigui Chan tells me her parents’ peculiar story: How a Tico and Chinese woman got caught up in history and landed in Nicoya. In mainland China, the festivities surrounding the Chinese New Year are intense and raucous, but here in Nicoya it is a much quieter affair. On Friday, February 8th, I gathered with about 70 people for the celebration of Chinese New Year at El Presidente Restaurant, which was closed to the public for the special event. On February 20, the Playas de Nosara ASADA water board, often referred to as the “American Project” ASADA, held a meeting assembly to let members know how things stand financially and resolved to send two new rate change requests to ARESEP, the Regulatory Authority for Public Services (Autoridad Reguladora de los Servicios Públicos). Playa Samara’s public library has found a new home. The library is housed and operated by a local non-profit organization, La Asociación CREAR, whose new office is now located opposite Intercultura Language School next to the beach. For more than five years, the unfinished condominium project Las Olas has been an eyesore in Guiones, but that is about to change, as the property has finally been sold and orders have been given to tear the structure down. For the past three years, young ballerinas in Guanacaste have been studying dance in conjunction with the Royal Dance Academy of London, an international institution for dance, and for the past two years they have participated in the annual international ballet exam to receive recognition for having attained a certain level of proficiency such as pre-primary, primary, 1st grade or 2nd grade. Channel 7 Telenoticias sent a news team to Nosara Feb. 26 to report on the local uproar following the release of a burglar caught red-handed inside a house at Playa Pelada, and almost 100 concerned residents appeared at the Casa Tucan during the videotaping to show their outrage.